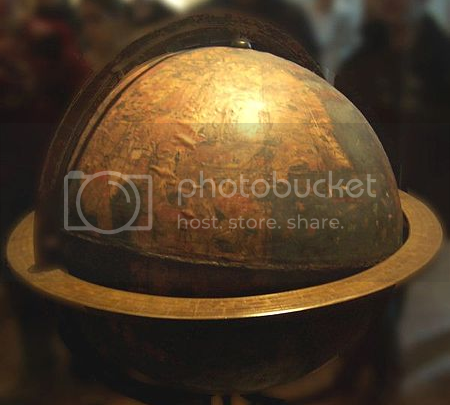 The above image shows a globe made by Martin Behaim in 1492. Filled with inaccuracies, it also does not depict the Americas because Columbus had not yet gone for the conquest of paradise and Americas were not part of the Eurasian trading system. But all that changed in a span of a century as large and wealthy empires fell to the Spanish. Following the fall of Constantinople, Europeans were forced to look for new trading paths to the East. This was essential to procure spices from India and silk from China by cutting out the middlemen. The two options they had at this point were warfare and exploration. Following the devastation inflicted by the Black Death, Europe was not in a powerful position in attacking the Muslims, though they were quite successful in expelling Muslims from the Iberian peninsula. But success on the East, where it mattered most, was almost impossible. Also, they lacked the wealth — gold and silver — for a massive war. Thus exploration became an option of necessity and few things lined up for them. First, there were advances in building ships like the caravel which helped them navigate longer distances. Second, they gained expertise in using the astrolabe and the compass as opposed to solely relying on the stars. Third, they discovered ocean currents and trade winds which helped them move across the Atlantic. Finally, they also figured out how to mount canons on ships and that changed the nature of maritime commerce. The mission to the Americas depended on various partners; it was similar to funding a startup. There were Venture Capitalists (kings and rich merchants), Business Team (explorers and exploiters like Vasco da Gama, Christopher Columbus, Hernan Cortes and Pizzaro) and employees (or slaves and low wage earners in this case). The explorers were motivated by wealth, fame and religion. While the first two are obvious, the last one requires an explanation. Europeans saw that they had to civilize the natives of the countries they conquered and thus found lot of support from the religious authorities. While those were the causes, the process of conquest had many components as well. The most common answer is “Guns, Germs and Steel”, but the process of the European conquest of the Americas had multiple components to it. The Americas, it is true, did not have guns or steel. They also did not use animals for fighting. They had their conflicts, but it was mostly never about conquest or exploitation, but about conquering people.The Europeans came with a much different mentality and weapons that the Americas could not win against. The task left incomplete by guns and steel, were finished off by the pathogens. The Americans were not immune to the European diseases and it decimated them. Thus the spread of small pox helped the Spanish kill more Americans than was possible using the sword. A less mentioned aspect of the Spanish conquest is the help they received from the insiders. 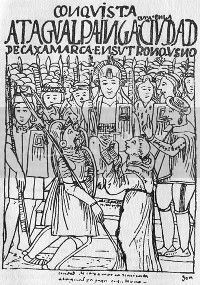 For example, Cortes had a mistress named Donna Marina who helped them in uncovering Aztec plots against the Spaniards and served as his translator. They also made alliances with the enemies of the people whom they were trying to conquer. As we saw in the lessons from Peru, some facts were conveniently left out in the European narratives. 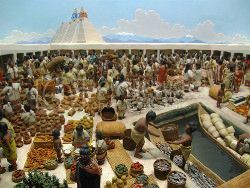 Thus with the case of the Aztecs, the Tlaxcalans and other Mesoamericans helped the Spaniards and with the Incas they were able to take advantage of a civil war. How else could few hundred Spaniards win a war in which tens of thousands of people fought? Once the Aztec and the Inca empires were conquered, the Spaniards had to find a way to keep it under their control as a colony. The Spaniards were a few and the empires they conquered, besides being wealthy, had a large population. The way they found was to attack the ruling class, decapitate the indigenous structure and replace the ruling elites with Spaniards. As money flowed up the native tribute-paying pyramid system, it reached the hands of the Spanish elites. During their early exploration phase, they had experimented with setting up colonies, importing slaves and cultivating crops for exports in the Azores and the Canary Islands. Now they were able to implement a large scale version of those laboratory experiments and Americas for the first time started growing things for the consumption of others.